Jaipur: When asked if the hike in the fuel prices affected him, Union Minister Ramdas Athawale confessed that he is unfazed by the hike, as he is a minister. Referring to the allowances he gets, Athawale, who was in Jaipur said, "I am not suffering from rising fuel prices as I am a minister. I may suffer if I lose my ministerial post." Acknowledging that people are suffering due to the hike in fuel prices, the Union Minister of State for Social Justice and Empowerment further said, "It's understandable that people are suffering from rising fuel prices and it's the duty of the government to reduce them." Athawale, who heads the Republican Party of India, assured that the Centre is working on the matter. "The price of fuel can be reduced if the states cut the tax on it. The Centre is seriously working on the issue," he said. 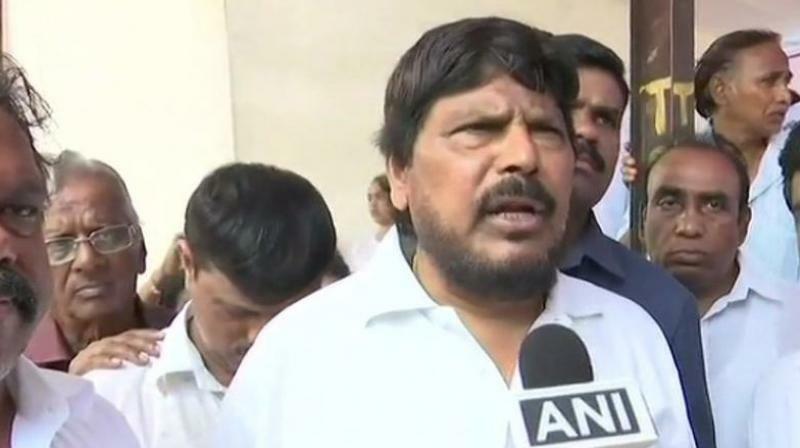 In response to a comment on fuel prices earlier, Union Minister Ramdas Athawale clarified, “Journalists had asked me prices of petrol and diesel is rising, if I have any problem with it. I had said I've no problem, I'm a minister, and we’re provided government vehicles. But people do face problems and prices should be brought down. I didn't say this to insult anyone." “If it has hurt people's sentiments, I express my apology. I had no intention to do this. I am a common man who became a Minister. I know the problems people face. I am a part of the govt and I demand that the price of petrol-diesel should be brought down,” he added. The Central Government has been facing flak from various quarters over a continuous hike in fuel prices. The Opposition had even called for a nationwide lockdown on Monday to protest against the increasing fuel prices.